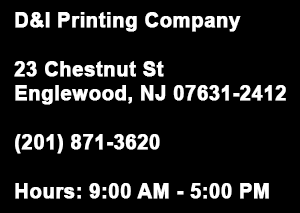 The Terms and Conditions (“Terms”) describe how D&I Printing Company, 23 Chestnut St., Englewood, New Jersey. (“Company,” “we,” and “our”) regulates your use of this website www.dandiprintingco.com (the “Site”). Please read the following information carefully to understand our practices regarding your use of the Site. The Company may change the Terms at any time. The Company may inform you of the changes to the Terms using the available means of communication. The Company recommends you to check the Site frequently to see the actual version of the Terms and their previous versions. We are committed to resolve any complaints about our collection or use of your personal data. If you would like to make a complaint regarding this Terms or our practices in relation to your personal data, please contact us at: support@dandiprintingco.com. We will reply to your complaint as soon as we can and in any event, within 30 days. We hope to resolve any complaint brought to our attention, however if you feel that your complaint has not been adequately resolved, you reserve the right to contact your local data protection supervisory authority. We welcome your comments or questions about this Terms. You may contact us in writing at support@dandiprintingco.com.